In the state, intentional homicides have grown up to 400% from January 2015 to September 2018. The Attorney General's Office of the State of Guanajuato (PGJEG) has not been able to solve the crimes perpetrated against their own personnel. They no longer say the crimes committed are considered "not serious"; which was, apparently, their previous stance. 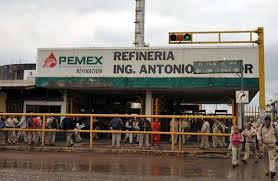 According to an analysis by Mexico Evaluates, called the homicides and huachicol, (fuel theft) the dominant pattern in Guanajuato, only in the first nine months of 2018 there have been 1,947 homicides perpetrated in the state. The organization describes the violence in Guanajuato as"Lethal". Guanajuato State previously did not suffer this level of violence and now stands out as being among the most dangerous states in the country. Between January 2015 and September 2018 the murders increased by 398%, " the document highlights. The murders committed in the entity this 2018 already exceed in 77% the number of victims in 2017, with three months remaining until the end of the year. 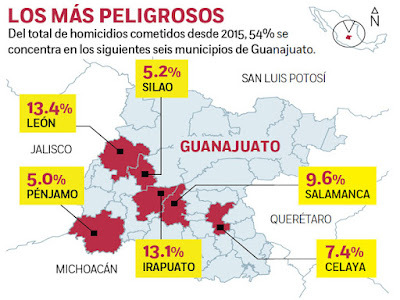 In addition, Mexico Evaluates, the monthly homicide rate in Guanajuato is double that of the national rate. By September it reached 5.2 homicides, while the average rate in the country is in two homicides. The red figure equals seven people executed per day, on average. In September alone there were 334 homicide victims, 11 each day. All this while the government of Guanajuato and the National Action Party defend the work of the Security Cabinet, headed by Attorney Carlos Zamarripa Aguirre and Secretary of Security, Álvar Cabeza de Vaca Appendini. The authorities of Guanajuato maintain that the theft of fuel allowed by the same heads of Pemex in the Ing. 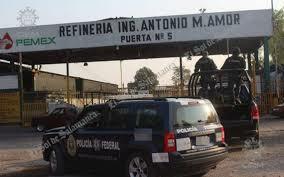 Antonio M. Amor Refinery is the cause of the insecurity that the state is experiencing. Just the afternoon of this Friday, a man was executed in Silao, on the road that leads to Irapuato and only a few steps from the Red Cross. The assassins fled and the elements of the PGJEG had not been able to attend to the corpse and crime scene more than three hours after the event, which caused a backup of traffic for hours. My little brother is often sent to visit his family in Guanajuato and I might have to protest his visits now. This is extremely worrying. People that get killed in Mexico, stays in Mexico. People getting wacked in Northern Michoacan also but news outlets are being blocked. The huachicoleros are fighting over gas pipelines. CJNG vs Cartel Santa Rosa. I go to Guanajuato 2 or 3 times a year. Its safe as long as you dont get out of hand and respect the people. Like any where else, you gotta be conscious of your surroundings. I think conscious is an understatement. Rather, body armor and few grenades to get yourself out of a tight rolled tortilla. Will never go back until things get under control. Which may be my lifetime. Maybe kids too. Sal, you're absolutely right. Funny how people always comment about wearing bulletproof vests and never going back to Mexico. Are these the same people that say "we can't let them win, we can't change our lives or we can't show any fear" when a mass shooting or terrorism happens in other countries? I've been to GTO quite a few times these last 2 years and while shootings can randomly occur at any time anywhere in the world, common sense goes a long way. Call me crazy but I wouldn't be speeding in a black Suburban on 22's with a group or guys with corridos blasting out of the speakers heading out at midnight to a bar,club or strip joint. Besides the topes out there would destroy my rims! Most good, sane people in all of Mexico know that if you're not involved in illegal activities or don't go in a bar and insult your local cartel "representatives," you'll come back home to the good ol US of A with your head on your shoulders.